Lorena Mancilla is the Director of WIDA Early Years. Her background as a bilingual educator, her passion for working with language learners and their families, and her experience with WIDA allows Lorena to make the purpose and use of language standards and assessments comprehensible to educators, administrators, and families of language learners. Her expertise in working with families of language learners launched family engagement initiatives at WIDA. She is also a core member of the Spanish language development (SLD) team where she contributes to projects and professional development focused on the WIDA SLD Standards and supporting children and youth in bilingual early childhood and K-12 settings. When she first joined WIDA in 2010, she was a member of the professional development team and her focus was facilitating workshops on English language standards, assessments, and data analysis. Lorena completed her Ph.D. in Curriculum and Instruction at the University of Wisconsin-Madison. 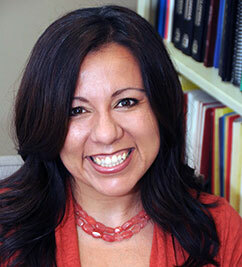 Her research focused on Latino parent engagement in K-12 language education.